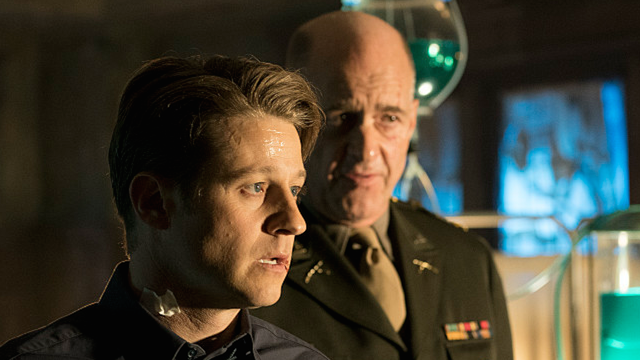 On the last episode of Gotham, Gordon nearly escaped death after being shot while trying to establish a ceasefire among the city’s gangs. Elsewhere, Ivy made her return to put her spell on Bruce, while Barbara and Penguin contemplated their next moves. 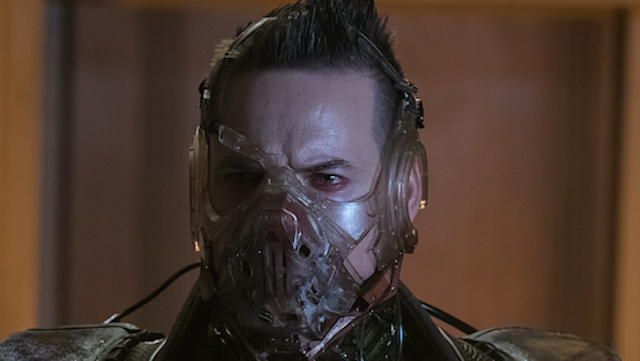 In Gotham season 5 episode 10, Bane makes his big introduction of the precipice of Gotham’s reunification with the outside world. Bane and Gordon finally come face to face, as Barbara came to Lee for help delivering her baby. Strange fixes up Eudardo and injects the venom into him, thus marking his transition into Bane. At G.C.P.D. in the present, Bullock is excited about reunification day for the city, but Gordon is slightly cynical about things being this easy. Bruce reveals that the water toxicity is now very low, and Gordon commends his men on the work they’ve done in the past year. Outside, the General and an army convoy arrive to meet Gordon, Bruce. and Bullock. Elsewhere, Selina and Alfred inspect a records room and we learn that they are looking for the building plans for Wayne Manor. Alfred Hopes to rebuild Wayne Manor to honor Bruce, explaining his motivation to an understanding Selina. As the military people test the water themselves, Gordon receives the call from Lee that Barbara is about to give birth, which he seems conflicted about. The General eventually approves the reunification process when Bane and his thugs arrive. Much to the shock of Gordon, he, Bruce and the General are captured and hauled away to an unknown location. An extremely pregnant Barbara arrives at the submarine site, where Riddler and Penguin are ready to leave the city. Barbara’s water manages to break while there, and Penguin promises to wait until she returns. When she leaves, he and Ridder naturally prep the sub for departure. Penguin says his goodbyes to Gotham when Riddler informs him that a crucial piece of the sub is missing. They surmise that Barbara has the part and decide to go after her to find it. At the hospital, Lee checks Barbara’s vitals, but she’s in a hurry to catch the sub. Lee is suspicious of her motivations, urging her not to rush the process. Penguin and Riddler eventually arrive, requesting the submarine piece that she stole. Barbara reveals that she hid the crucial piece, when Bane arrives to menacingly announce his presence to her over a loudspeaker. 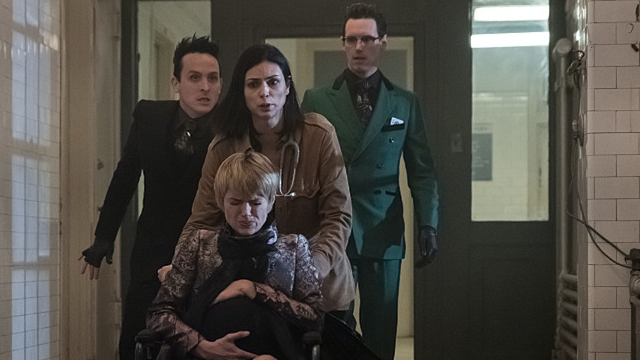 Lee, Barbara, Riddler, and Penguin all try to escape the hospital together. The latter two decide to create a distraction in order to let the former two escape in one piece. Riddler and Penguin blow up some oxygen tanks as a method of distracting Bane, but he remains undeterred. As Barbara’s contractions increase, she shoots some of Bane’s men while Lee hurries to get her out of the hospital. Eventually, it’s revealed that Riddler managed to steal the part back because Barbara actually had it on her the whole time. Much to Penguin’s delight, they go off to make their escape. After the Bane attack, Bullock rounds up the remaining men when Selina and Alfred arrive. They ask to help, and Bullock sends them to search part of the city. Later, Gordon awakes to a monologue from Bane about his new getup. Bane argues that Walker is ushering a new world. 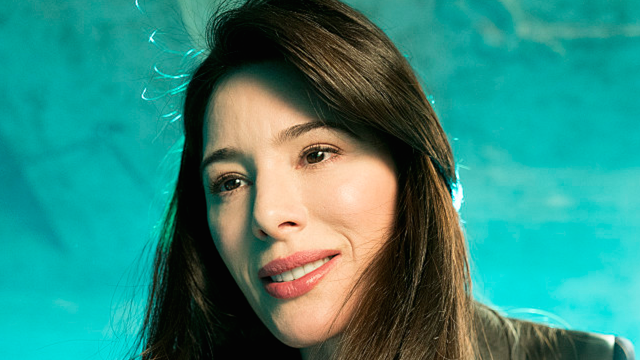 Walker enters, she instructs Bane to beat Gordon up as a way of taunting Bruce into realizing her true identity. Although he tries to deny the answer, Bruce eventually guesses that she is Ra’s Al Ghul’s daughter, Nyssa. She claims that Bruce and Gordon are just the beginning of her reign of terror, and Bruce accepts responsibility for killing Ra’s. Due to the fact that Barbara was involved with her father’s death, Nyssa instructs him to retrieve her while Strange injects Gordon with a sedative. Bruce asks Nyssa what she wants from him, and she reveals her plan to reduce the city to rubble. However, she also wants Bruce to “suffer and die” watching it happen. Gordon awakes on an operating table with the General nearby. Strange monologues about his plans to give Gordon the same treatment that he did to Eduardo. Through a ridiculous set of circumstances, Bruce is able to escape. But just as he does, some thugs arrive. Bruce quickly takes them out and calls the GCPD, with Alfred answering the radio. He urges them to get to the hospital to assist Barbara and Lee. Back with Strange and Gordon, he begins the Venom injection process, but Gordon is able to break free before it takes hold. He quickly takes down Strange, but he lets him escape. Gordon frees the General, and they meet up with Bruce. Barbara realizes that they stole the part back when she and Lee arrive in the parking lot. Lee promises that Gordon won’t take the child from her, and Barbara admits that she trusts her to keep the baby safe. Barbara eventually gives birth in the parking lot, while Lee and Barbara bond over the newborn. Much to their surprise, Bane crashes down out of the Building. Out of nowhere, Alfred and Selina crash a car into Bane. Sending the two away, Selina and Alfred face Bane. Bane unsurprisingly beats Alfred to a pulp, while Selina looks on in horror. Gordon, Bruce, and the General arrive at a makeshift military base, where Bullock gives word that everyone made it out of the clinic alive. The General radios the mainland and orders a bombing run on the city. He also orders his men to detain Gordon, Bruce, and Bullock. Simultaneously at the Sirens club, Barbara and Lee are captured by Nyssa. She puts her hand on the baby’s head as Barbara looks on in shock. Bruce, Bullock, and Gordon escape custody quickly, and they realize that this was all part of Nyssa’s plan. As they escape, a fleet of Helicopters begin to bomb the city. The trio can only watch helplessly from below. 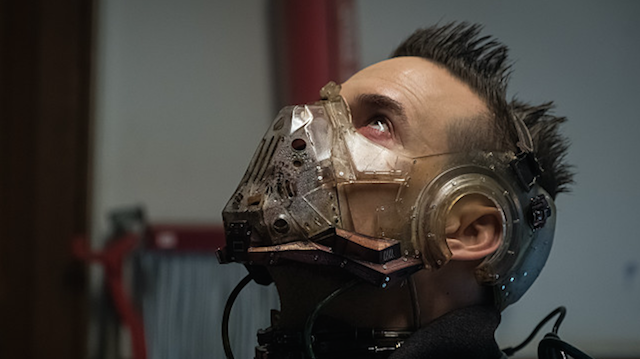 What are your thoughts about Gotham season 5 episode 10? Make sure to let us know in the comment section below!